At the invitation of Premier Li Keqiang of the State Council, Prime Minister Lee Hsien Loong of the Republic of Singapore will pay an official visit to China from September 19 to 21. During his visit, the Chinese leaders will meet and hold talks with him and exchange views with him on China-Singapore relations and the issues of common interest. In addition to Beijing, Prime Minister Lee Hsien Loong will also visit Fujian Province. Vice Premier of the State Council Wang Yang will attend the opening ceremony of the 2017 Euro-Asia Economic Forum and deliver a keynote speech in Xi'an, Shaanxi Province on September 21. The Euro-Asia Economic Forum is a high-level and open international meeting for the Eurasian region by taking Shanghai Cooperation Organization (SCO) member states as the main part. It is held biennially and to date it has been held for six times. The forum plays an important role in promoting the mutual understanding and pragmatic cooperation across the board between the Eurasian region and the countries along the route of the Belt and Road Initiative. The 2017 Euro-Asia Economic Forum will be held in Xi'an, Shaanxi Province from September 21 to 23 this year under the theme of "Jointly Building the Belt and Road Initiative: Synergizing Development Strategies". The forum will be divided into three parts, namely the Opening Ceremony, Plenary Meeting and Parallel Forums, International Production Capacity Cooperation Exposition and Xi'an International Investment and Trade Fair. Prominent political leaders from Afghanistan, Nepal and other countries in the Eurasian region will attend the forum upon invitation. Q: What is your response to the DPRK's another missile test this morning? Is China going to change its policy towards the DPRK? A: The Chinese side has noted relevant move. 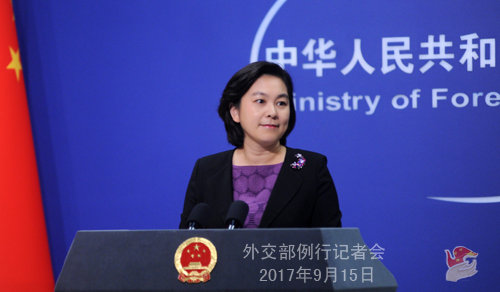 China opposes DPRK's launching activities using ballistic missile technologies in violation of the relevant stipulations of the UN Security Council resolutions. Currently, the situation on the Korean Peninsula is complex, sensitive and grave. All relevant parties should exercise restraint and refrain from taking the actions that could heighten the tensions on the Peninsula and of the region. The Chinese side will continue implementing the relevant resolutions of the UN Security Council in a comprehensive and complete manner. Q: Today, the US Secretary of State Rex Tillerson said that China and Russia must indicate their intolerance for the DPRK's reckless missile launches by taking direct actions to make the DPRK change its course of action. What is your response? A: I have taken note of the relevant report. Regarding the Korean Peninsula nuclear issue, the Chinese side has stated its positions many times. In addition, I would like to stress the following points. First, the Chinese side implements the relevant resolutions of the UN Security Council in a comprehensive and strict manner and has made enormous sacrifice and paid a heavy price for this. 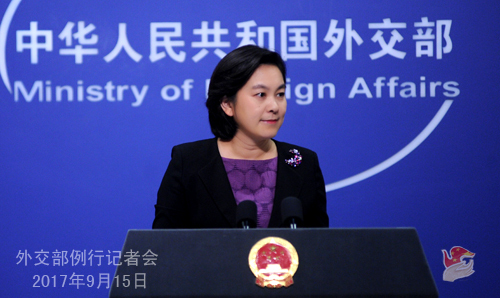 It is beyond doubt that China is resolute in its determination to promote the denuclearization of the Korean Peninsula and uphold the international non-proliferation regime and China is sincere in and has made unremitting efforts for earnestly fulfilling the relevant international obligations. Third, all the DPRK-related resolutions of the UN Security Council, including the just adopted Resolution 2375, on one hand, explicitly state the collective position of the international community to oppose the development of nuclear and ballistic missile capability by the DPRK and uphold the international non-proliferation regime. On the other hand, they also reaffirm the commitment to peacefully resolving the issue through diplomatic and political means. These two aspects are equally important and they cannot be overemphasized or overlooked. Fourth, peacefully resolving the Korean Peninsula nuclear issue has increasingly become the consensus of the international community. Meanwhile, more and more people have come to recognize that sanctions are not the fundamental way to address the issue. The pressing task now is that all relevant parties should immediately stop the dangerous and provocative words and deeds that could escalate the tensions on the Korean Peninsula, take concrete actions to implement the relevant resolutions of the UN Security Council in a comprehensive and balanced manner and make constructive and positive efforts and create enabling conditions for seeking a long-lasting solution through peace talks at an early date. Q: Japanese Prime Minister Shinzo Abe has wrapped up his visit to India. After the meeting, the Prime Ministers of Japan and India issued a comprehensive Joint Statement. This statement reaffirms that the disputes in the Indo-Pacific region including disputes in the South China Sea should be settled peacefully in accordance with the United Nations Convention on the Law of the Sea (UNCLOS). In the statement, there is also an allusion to the Belt and Road Initiative, saying that all relevant countries should follow the international standard and the spirit of inclusiveness. The two countries also said that they will set up the "India-Japan Act East Forum". Meanwhile, Japan also announced to increase its investment in northeast India. My question is fairly long. I would like to know the Foreign Ministry's view on the above-mentioned contents of this Joint Statement. A: We have also noted Japanese Prime Minister Shinzo Abe's visit to India. I have also read the Japan-India Joint Statement mentioned by you attentively. I have not found the word "China" in the statement. However, it seems that the Japanese and Indian media are all interested in the statement's possible "allusion" to China mentioned by you just now. So, I am wondering whether this is the overinterpretation of the media or just like the media's conjecture, both Japan and India have the hidden agenda. As far as I am concerned, it is better to ask Japan and India and see whether they can make some clarifications on this. Since there are so many points mentioned by you, I will give brief responses to them one by one. The statement mentions the freedom of navigation and settling disputes peacefully. 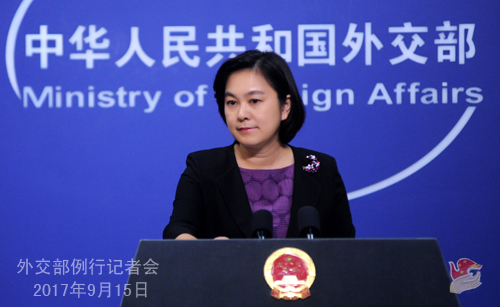 We all know that it is China's consistent position to resolve disputes through dialogue and consultation by the parties directly concerned and uphold the freedom of navigation and overflight that all countries are entitled to in accordance with the international law. We hope that all parties can make concerted efforts to uphold the freedom of navigation and overflight enjoyed by all countries in relevant waters under the international law and stay committed to settling the issues and disputes between them through dialogue and consultation. With regard to promoting regional connectivity, China always holds a positive and open position. In fact, the goal of the Belt and Road Initiative proposed by China is to encourage all countries to jointly enhance regional connectivity and the building of infrastructure, enable us to benefit from it together and achieve common development and prosperity by following the spirit of openness, inclusiveness and mutual benefit and adhering to the principle of extensive consultation, joint contribution and shared benefits. You also mentioned the "India-Japan Act East Forum" and Japan's stepping up of its investment in northeast India. I think you are quite clear that the boundary between China and India is yet to be totally delimited and there are disputes over the eastern section of the China-India boundary. China's position on the boundary issue is consistent. Now China and India are working on seeking a fair and reasonable settlement which can be accepted by both sides through negotiations. Under such circumstances, we believe that any third party should respect the efforts made by China and India to settle the disputes through negotiations and any third party should not meddle in the disputes between China and India over territorial sovereignty in any form. I want to add that both Japan and India are important countries in Asia. We hope that the development of normal relations between Japan and India can play a constructive role for the mutual trust and cooperation between regional countries and the peace, stability and development of the region. Q: Yesterday the head of Russian delegation in the Astana talks said that China, the United Arab Emirates, Egypt and Lebanon are likely to become the observer states for the next round of negotiations on the issue of Syria in October. Is China willing to become one of the observer states for the Astana talks? A: The goal of the Astana talks is to guarantee the ceasefire in Syria and effectively complement the Geneva peace talks. The Chinese side always maintains that the political settlement is the only realistic way out for the Syrian issue. We hope that the new round of Astana talks can achieve positive outcomes and contribute to cementing the ceasefire and the cessation of violence and realizing the political settlement of the Syrian issue in the end. The Chinese side supports all the efforts that are conducive to the political settlement of the Syrian issue and is willing to continue playing a positive role in this respect. Q: The British government has just released the latest Six Monthly Report on Hong Kong. What is China's comment on that? A: We just celebrated the 20th anniversary of Hong Kong's return to China. Over the past two decades, Hong Kong has enjoyed continuous prosperity and stability, maintained its own distinctive features and advantages and achieved considerable progress in all areas. The practice of "one country, two systems" has made world-renowned success in Hong Kong. Since July 1, 1997, the affairs of Hong Kong fall within China's domestic affairs in which no country has the right to interfere. We always firmly oppose the British government's regular issuance of the so-called Six Monthly Report on Hong Kong since the return of Hong Kong. We request the British side not to issue the relevant reports and stop interfering in the affairs of Hong Kong. Q: It is learned that today an Ecuadorian ship was out of contact near the waters off the coast of Peru. It is reported that Chinese ships have come to its rescue. Can you confirm this information? A: According to our information, on September 14 local time, an Ecuadorian ship named ADRIANTA went missing near the waters off the coast of Peru. There are six Ecuadorian sailors onboard. After receiving the message for help from the Peruvian Coast Guard Department, four Chinese fishing ships which were operating nearby immediately came to its rescue at maximum speed. Now the search and rescue efforts are still underway. The Chinese side will continue going all out to assist in the rescue efforts. We hope that the Ecuadorian sailors onboard can be rescued safe and sound. 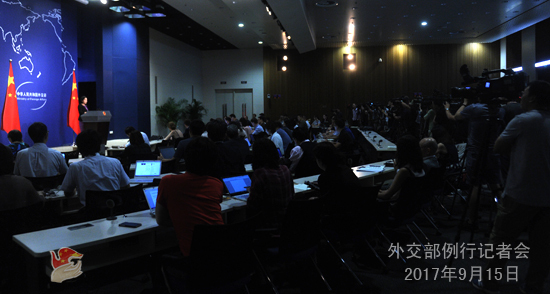 Q: After the DPRK's nuclear test, the Chinese side said it agreed that the UN Security Council takes new actions. Now the DPRK tested another missile. Does China think that the UN Security Council should take further steps? A: After the sixth nuclear test on the part of the DPRK, the UN Security Council unanimously adopted a new DPRK-related resolution through consultation. Bearing in mind the goal of realizing the denuclearization of the Korean Peninsula, upholding the international non-proliferation regime and maintaining the peace and stability of the Peninsula, we implement the relevant resolutions of the UN Security Council in a comprehensive, strict and faithful manner. Meanwhile, we also hope that all relevant parties can implement the relevant resolutions of the UN Security Council in a comprehensive and balanced way. Specifically speaking, on one hand, we need to take measures to halt the nuclear and missile development process of the DPRK. On the other hand, all relevant parties should take concrete and effective measures to create enabling conditions for promoting the settlement of the Korean Peninsula nuclear issue through peace talks as soon as possible. We hope that the relevant parties of the international community, especially the parties directly concerned, can shoulder their due responsibility and obligation and make joint efforts to form synergy to achieve this goal.